Sergei Skripal and his daughter Yulia were poisoned at his home in March. THE NERVE AGENT used to poison a former Russian spy and his daughter in the English town of Salisbury last month was delivered “in a liquid form,” Britain’s environmental department has said. AFP reports that Britain’s Department for Environment, Food and Rural Affairs (Defra) announced today that the home of Sergei Skripal was targeted with a “very small amount” of nerve agent when he and his daughter Yulia were poisoned on 4 March. Yulia has been discharged from hospital while Sergei Skripal, 66, remains in hospital, though he is no longer in a critical condition. Work to decontaminate sites in Salisbury affected by the nerve agent begins today, but the process will take months and involve around 190 specialist military personnel from the Army and RAF. These locations include part of the Maltings shopping centre where the two collapsed, the Zizzi restaurant and Mill pub where they visited that day, and the family home on the outskirts of the city. The home of the police officer injured in the incident, Nick Bailey, also needs to be decontaminated. These sites will remain secured until the work undertaken is reviewed and approved by the government. This work will involve testing and removing items that may have been contaminated, and chemical cleaning. Public Health England reaffirmed that the risk to the general public is low. Defra’s chief scientific adviser, Ian Boyd, said that the “number one priority is making these sites safe for the public, so they can be returned to use for the people of Salisbury”. Meticulous work is required and we expect it will be a number of months before all sites are fully reopened. Today, a small cordoned area of London Road cemetery was the first area to be reopened to the public. Extensive investigations and testing established that the grave of Skripal’s wife Luidmila was not contaminated, Defra said. The cleanup comes in addition to the announcement of £2.5 million (€2.8 million) to support businesses and tourism in Salisbury, as well as unexpected costs that arise as a result of the recovery efforts. 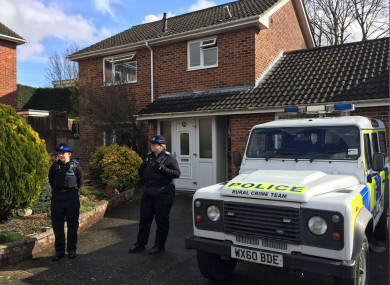 The police previously believed that the pair had been poisoned at the front door of Skripal’s home. Police said that the highest concentration of the nerve agent was found here. Russia has denied the UK’s claims that it was behind the attack. Last week, the Organisation for the Prohibition of Chemical Weapons said it had confirmed the UK’s findings that the nerve agent originally came from Russia. Email “Nerve agent used in Salisbury attack delivered in 'liquid form', UK government says”. Feedback on “Nerve agent used in Salisbury attack delivered in 'liquid form', UK government says”.